There are few Native American artifacts of ancient construction in North America. Americans traveling to Britain and Europe are often jarred when they discover a landscape filled with evidence of human construction that’s thousands of years old. Imagine driving past a five-thousand year stone circle every day on your way to work! Whether you’re planning a visit or are just an armchair tourist, take a literary journey of England’s sites of ancient magic with “Landscape of Memory.” This book is chock-full of lore and legend, and scattered throughout with evocative photographs and drawings. The book’s content is divided into four regions: South East England, Mercia, Wessex, and South West England. Each regional section contains a mix of articles, most previously published in Merry Meet magazine. 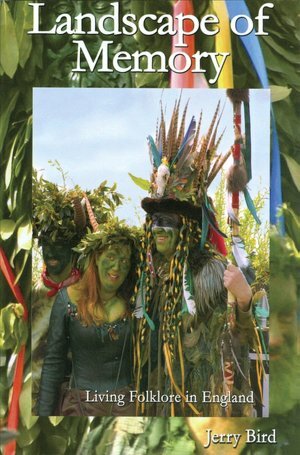 There’s information about historic sites and local legends, and reports about annual Sabbat celebrations hosted by England’s active neopagan community. England is dotted with the remains of Neolithic, Bronze Age and Iron Age stone circles, barrows, cairns and hill forts. Careful directions are included for each site, with tips about good pubs, restaurants, and parking areas. The modern age hasn’t always been kind to England’s prehistoric sites. Time, agriculture and highway construction have taken a toll, and the National Trust and local historic preservation societies are a fairly recent response. Preservationists don’t always win the battle against land owners, industrialists and developers. Yet artifacts up to 5,000 years old are still intact and open for curious visitors and tourists. Since Stonehenge and Avebury get plenty of coverage elsewhere, Jerry Bird describes numerous lesser-known stone circles. Articles on lore include an overview of the history of the Horned God, Boudicca, Hunting of the Wren, and Tinners Hares. There’s a wonderful article about the evolution of the song “John Barleycorn” that leads into a history of the folk-song movement in England. It includes a list of pagan-oriented UK musical groups and recommended CDs from the 1960s to the present. The final article, “After the Deluge,” describes the devastating flood that swept through Boscastle, North Cornwall, in 2007. The flood damaged a good bit of the town, which is the home of the Museum of Witchcraft. The building survived, but the structure and some of the exhibits were cruelly damaged. The author visited Boscastle some days after the flood to retrieve a damaged faery automata on loan to the museum. Bird’s photographs record the aftermath of the flood’s destruction. After much loving labor, the town and museum were restored and this popular visitor’s attraction re-opened in the summer of 2008. Bird is a lively writer, able to present history, archeology and lore in an attractive manner that’s fun to read. There are so many pagan treasures to see in England! Readers will want to book a flight across the puddle. This is a fine book to read when planning an itinerary. Make sure you have a map on hand, because there isn’t one in the book. Although the topics bounce around a bit, the collection feels seamless. Highly informative and well-written – recommended!